Workday: Thomas Point Lighthouse – June 30, 2016 – Chesapeake Chapter U.S.L.H.S. 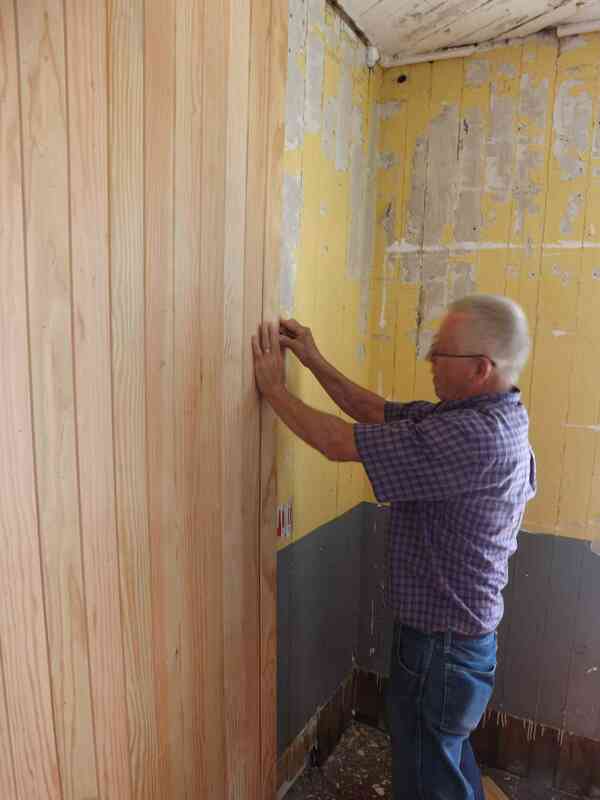 Hobie prepares a new strip for nailing. 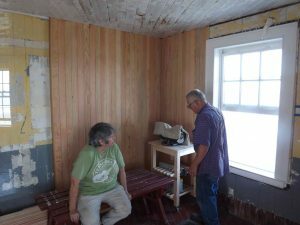 A small crew went out on June 30th and delivered some new deck boards that were pre-primed by Howard and Cathy. They are to be used to replace more of the decking. They plan to have all the main deck replaced this year so it is all uniformed and fresh. Volunteers concentrated on the equipment room this time. Hobie and Tony installed about 25 new wooden tongue & groove siding strips to the wall that was started the previous week. Some of the old gray baseboard and the quarter-round molding was removed. That required some elbow grease. They also scraped a lot of loose paint from the walls and ceiling. Then they swept and vacuumed the floor and stacked the old lumber. Oddly something was missing…. Ah there was no painting on this work day. Tony reports that the dock was very clean – so maybe the bird deterrent is actually working. That and the recent gulley washing thunderstorms may have done the trick. 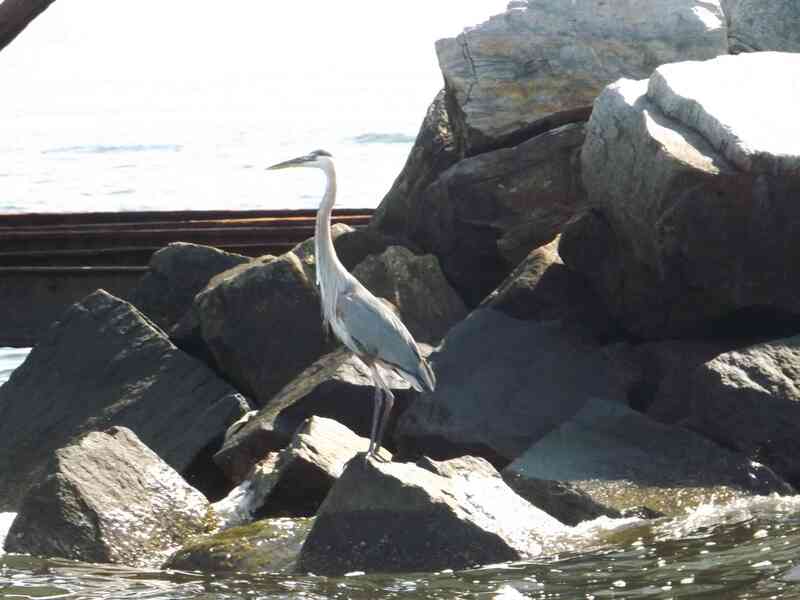 They did observe a tall bird on the riprap on their arrival – a blue heron! 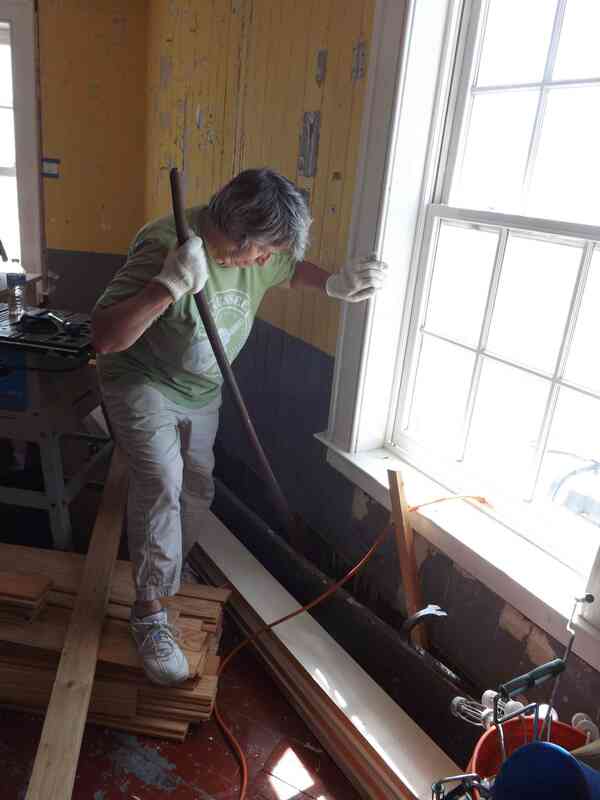 Virginia uses “Big” crow bar to remove baseboard. Virginia and Hobie relax in equipment room after busy day. A blue heron stops by to inspect the light.